The first bus on the Bilbao City Tour departs every day at 10:30 am from the Guggenheim Museum. There are information boards at the stops that show the approximate times when the first and last bus pass through the various points. The last bus leaves the Guggenheim Museum at 6:30 pm in the peak season and at 5:30 pm in the off season. How long does it take to cover each route? The route lasts approximately one hour. 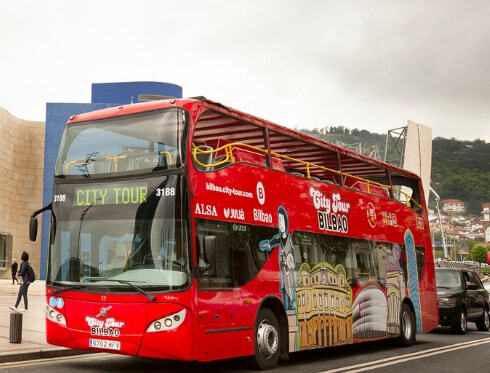 The Bilbao City Tour has a fleet of buses that allows us to offer the service once an hour in the off season and every half hour in the peak season. Yes, every bus has a guide or driver who speaks several languages and who will do their best to answer your questions about the Bilbao City Tour service, as well as recommending interesting spots in the city and its surroundings. You can get on the bus at any of our stops. If you don’t have a ticket, you can buy one on board. Where do the routes depart from? The main stop is opposite the Guggenheim Museum. However, you can board the bus at any of the stops. The Bilbao City Tour routes are circular, meaning you can return to the bus stop where you caught the bus or to any other stop at any time. How can I stay up to date on any service disruptions? Any service disruptions will be reported on our website. We recommend visiting our website on the day you wish to use the service to get the latest information. Most of our buses are red, double-decker buses with an open-air top deck. All of our buses should be entered by the front door and left by the rear door, except for wheelchairs which should enter via the rear door. Yes, all our buses have an automatic audio guide in 8 languages: Basque, Spanish, English, French, German, Italian, Catalan and Galician. You will be given a free headset when you buy your ticket and all you have to do is choose the right channel to listen to. Are the buses covered and do they have a roof? Our buses have a sliding roof that is only used in the event of rain. If you wish, you can also travel in the climate-controlled lower deck. Bear in mind that, for your own safety, you must be seated at all times in any of the available seats. Is there space for wheelchairs? All Bilbao City Tour buses have access ramps and space for wheelchairs inside the vehicle. Each bus has the capacity to carry a maximum of one wheelchair. You can buy tickets on board any of our vehicles as well as at various official points of sale, and on our website. When you buy your ticket online, all you have to do is go to one of our stops and show the voucher that you will receive via email, either on your phone or printed out. Is the ticket valid for the day or for 24 hours? A Bilbao City Tour ticket is valid for one day. We have special rates for large groups. Email us at the email address in our contact section for more information. Can I rent a whole bus for a private tour? Yes, we offer special rates for private services, which can be personalised. Email us at the email address in our contact section for more information. Children up to and including the age of five ride free of charge. Between the ages of 6 and 11 they pay for a child’s ticket, and from the age of 12 they are considered adults. You can see our latest prices on our website. No, you do not. You can show the voucher either printed out or on your mobile phone when you first board the bus, when it will be exchanged for a ticket and you will also be given all the relevant material. Do I need to bring my own headset? No, you do not. However, if you wish, you’re more than welcome to bring your own headset and plug it into the bus’s sound system via the 3.5 mm mini jack connections. 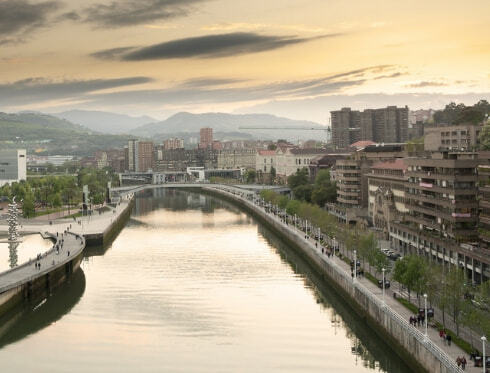 As the Bilbao City Tour is a service offered on moving buses, it is important to follow carefully all of the safety rules given by the staff and described in the audio guide. It is not permitted to stand up, eat, drink, smoke or travel with an open umbrella on the upper deck while the vehicle is in motion or to throw anything off the vehicle. No animals or pets are allowed on board Bilbao City Tour buses, except for guide dogs. No, all passengers are expected to wait in line at the stops regardless of whether they already have their ticket or not. No, it is prohibited to smoke anywhere on board any of our buses. Yes, we offer a wide range of excursions. Bilbao City Tour bus staff will inform you on board our buses, where you can get special discounts and other benefits. I’ve lost my ticket. What should I do? A valid ticket is required to ride on the bus. Unfortunately, we cannot replace or exchange tickets that have been lost or stolen. Unfortunately we cannot accept any other proof of purchase or vouchers which have already been used. Please keep your ticket after buying it, as you will need to show it when getting on the bus and during routine inspections. It is the passenger’s responsibility to ensure that they have been given a ticket when entering the bus or to mention it to staff on the vehicle when purchasing the ticket. You can email us at customers-bio@city-tour.com. Who should I write to if I wish to make a complaint about the service? If you are not satisfied with our service, you can email us at customers-bio@city-tour.com. We will need as much information as possible so we can consider your case and get back to you as quickly as possible. I made a purchase on the website and I don’t know if it was processed correctly. How can I find out? If the transaction was processed correctly, you will receive a confirmation email. In any case, if you have problems with phone coverage, before repeating the purchase, check your email for our confirmation. I made a purchase on the website and I haven’t received the vouchers yet. What should I do? If you made a purchase and didn’t receive an email with the vouchers attached, please contact us at customers-bio@city-tour.com so that we can send them to you.